Yesterday Phil Twyford was confirmed as the new Transport Minister with Julie Anne Genter as an Associate – a powerful team to change transport in NZ. Twyford also picked up the role of Housing and Urban Development. Given housing and transport are two sides of the same coin, it’s great that we might finally be able to see some co-ordination and integration between these two critical portfolios. There is clearly a lot that needs to be done in both portfolio’s and Twyford’s wasted no time in outlining an ambitious home building scheme. Positively, a lot of it will be focused around public transport such as train stations and the now to be build light rail. While we’re keen to see housing, light rail, our Regional Rapid Rail and many other projects get underway as soon as possible, one of the first things we’d like to see Twyford tackle is ensuring we make the most of City Rail Link. The timing for this is critical as City Rail Link Limited are working through tender processes for the project right now. Broadly, there are two key areas we’d like improved. Auckland has a well documented history of underestimating demand and so building projects too small. One needs to look no further than the Harbour Bridge to see a classic example but there are plenty of others. As I understand it, CRLL based their demand models on the capacity of our trains and the number that can use the CRL, not the total demand from the public. As such it’s quite possible that demand from the public will exceed this and fixing the CRL later is likely to be prohibitively expensive. However, with some changes it could be possible to significantly boost the potential capacity, something I discussed in this post. The current plan is to allow for 36 trains per hour (18 per direction) through the CRL at opening. Later with further investment that could be boosted to 48 trains per hour. But there are a number of ways capacity could be boosted even further. Most critical for this discussion is that some of those include designing the stations to allow for longer trains. When combined with changing the layout of our trains to increase standing capacity, it could be possible to almost double the theoretical capacity of the CRL. The capacity of different options is shown below. There are two key changes that would need to be made to the CRL designs to allow for this potential future. The stations would need longer platforms. 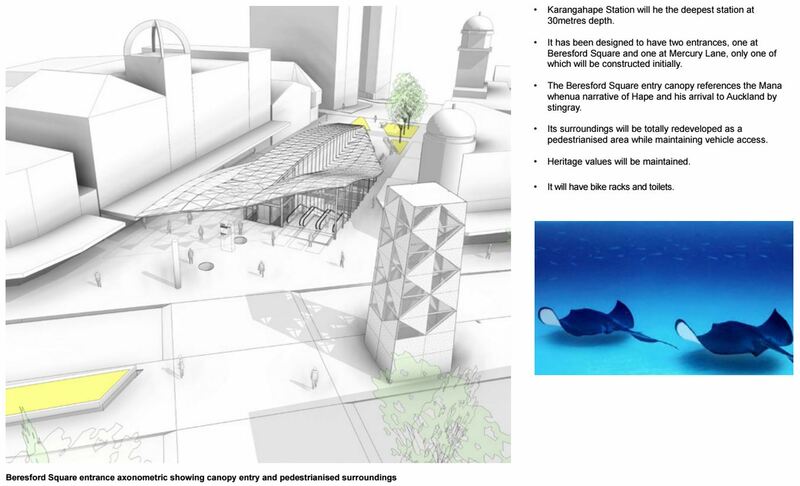 The most crucial in this regard is the Karangahape Rd station as that’s the one that would be the hardest to go back and change. Other stations on the network would also need upgrading if we ever went down the route of longer trains but they generally don’t have as many physical constraints as an underground station would. Obviously there’s a cost to building longer platforms but perhaps some of that could be recouped by using the space for retail or other activities until such time as it’s needed. The designs for the stations (and surrounding streets) would need to have sufficient capacity to circulate all of the extra people that could potentially pass through them. That means they’ll likely need additional exits (which also makes the stations more useful) as well as other measures like platform screen doors. On the doors, I understand that the stations are designed for them eventually but also that they’ll cost a lot more to retrofit later than if done upfront. The station was designed with two entrances, one at Beresford Square and one down Mercury Lane. However, the current plan is to only build one entrance initially and that would be the Mercury Lane one. It’s a decision we’ve been critical of a long time. 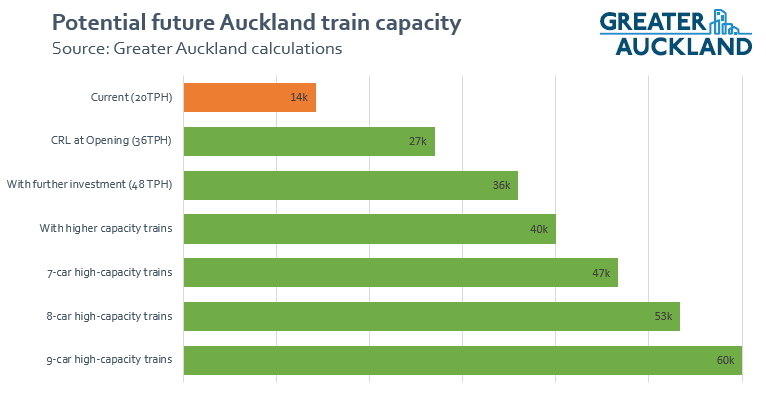 Given how frequently PT projects in Auckland have underestimated demand, most recently with the impact of electric trains. We think it’s quite likely this could happen again. But there’s an even more important reason why we need the Beresford entrance built right from the start, for accessibility access. The Mercury Lane entrance is about 90m down a steep hill from K Rd. Again, Meale seemed to dismiss this as an issue. Not a difficult walk for an able-bodied person maybe but much more difficult for those with disabilities. From what I can tell, the access up to K Rd, the main destination for people using the station, exceeds various standards. This wouldn’t be an issue with a Beresford Square entrance which is close to level with this part of K Rd. We do have other issues with the CRL, such as the Albert St design, but these two are the most pressing as they’re the hardest to change later. The government is a 51% owner of CRLL (Council the other 49%) so we hope that Twyford is able to use this shake things up and help deliver better outcomes from the CRL. Shane Jones is also Associate Transport Minister. Presumably his responsibilities will fit in with his regional development role, and therefore be more focussed on transport in the regions; local roads, rural state highways, freight and regional passenger rail, shipping. IMO also critical is a grade separated junction at Mt Eden that allows trains to go east and west without crossing. At 48 tph that’s 24 tph to/from the west and 24 tph to/from east to Newmarket and south to Manukau and the Airport (if the Airport was done right, with heavy rail from Onehunga not light rail from dominion road). And at the other end it’s 24 tph north via devonport and takapuna up the shore and 24 tph east via the mainline. That junction will be grade separated. Heavy rail to Airport means less capacity on the Southern Line. Ligh rail gives ability to reach areas that can’t be feasibly accessed with heavy rail, particularly by providing more capacity around the isthmus (Dominion Rd, Mt Eden Rd, Sandringham Rd). Having two complementing sets of networks is much better for resiliency and coverage. Heavy rail to the airport doesn’t have to mean less capacity on the southern line. If it’s an extension of Onehunga then it’s simply that, an extension, so the capacity would be exactly the same as if the extension wasn’t built. If it is done as a branch or continuation from Manukau then once again there isn’t any capacity changes. Except that Onehunga feeds back onto the Southern Line. It’s not about the capacity of the trains. It’s that putting junctions on the southern running at 24tph each way, plus say 12thp each way on the Manukau-Airport, means you have 72 trains running through a cross junction an hour. That’s 48s between each train, including the time taken for a train to pass through it. That’s not even considering resilience etc. Putting all your eggs in one basket and having no redundancy in the network is a ridiculous idea from an engineers point of view. Doesn’t the Onehunga branch line only run three trains an hour now? It is only single track. That would be a service level greatly inferior to the existing Skybus. Every 30min. I think the CRL could provide option for higher freq, but not sure what the limit would be on a single track. Easy to double track? Maybe. Lot of buildings are quite close to the tracks. It could go to 3tph with the existing single track, capacity at Britomart is the current limiting factor. I think double tracking would require some significant land purchases. Roughly $500M or more to double track and close level crossings on Onehunga line (which u would need with that frequency). Involves moving Penrose and Onehunga stations as well. So maybe limited short term value (BCR) if that 500 million can be spent on adding PT via other routes. In sense that is an argument against HR via Onehunga. Grant – Why do the level crossings need to be closed with 6tph? There are numerous level crossings on existing lines with that frequency. Yes and they all should be closed in time, people are dying or severely injured on them & the network getting disrupted each time. I don’t think any new track work should be done half baked now we know how much use we are getting & going to need out of the HR network. Longer 6 or even 9 unit trains to clear crossings. Double tracks means coming in both directions potentially at same time adding to danger by the extra width to cross & navigate on foot or vehicle. Traffic getting held up due to 3x or potentially more trains than cross currently (also an increase in vehicle traffic over time presumably). If we didn’t use this as the/an airport line, probably wouldn’t be worth double tracking and hence you won’t get 6tphpd. It presently takes 12 minutes for a train to do the return journey from Penrose to Onehunga, excluding slack time at the Onehunga end. Allowing headway and time for the driver to change ends you’re beyond the 15-minute window to allow 4tph, so the maximum capacity without adding a passing loop is 3tph. Of course, if the multiplicity of level crossings were closed that journey time would probably drop by a couple of minutes each way, so 4tph could be achieved without having to double-track. Yes even closing perhaps some less important side roads that cross may get it quick enough? You still have the issue of timing trains from west or city end though to perfectly line up or you miss the chance to get to Onehunga & back in time without mucking the timetable up. It would be good to get this frequency up as in the new central bus network you won’t have the 009 bus that kind of duplicates this section of the route and so would be stuck with a lame 1/2 hr frequency as now. So at least 20min frequency is possible I guess after we get more trains & certainly post CRL, a 50% improvement & I reckon so much better psychologically. One thought is at present they could run 20min freq off peak as they have more trains sets, but that’s kind of weird I guess. But the airport can be feasibly accessed with heavy rail, and in fact it would be the easiest option. Mt Roskill light rail is about solving the Dominion Rd bus congestion issue, and can’t come soon enough. Oh, that’s rad. I thought they’d decided against that at one point but I haven’t kept track. So two main heavy rail lines, north-south, and east/west via the CRL. Airport is served either as an extension of the Onehunga branch, or as a new branch from Otahuhu. Does mean we drop the Parnell station, but that’s a terrible excuse of a station to force trains to serve anyway and would be better served by some local LRT service. I can see an issue here: there is plan for any heavy rail to the Shore ATM. Those trains would have to terminate somewhere, that’s not a problem in itself, but it does reduce the tph past the termination point, which means that the capacity could not be realised until we have heavy rail to the Shore. 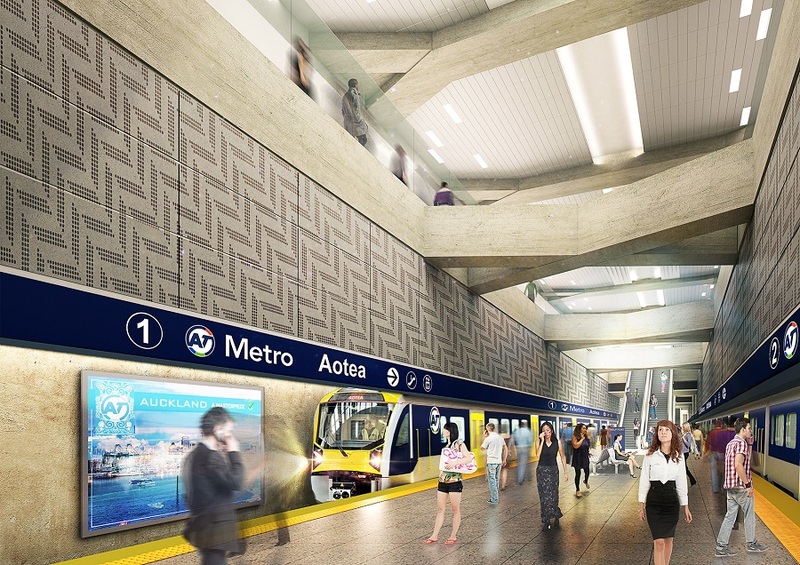 That rail (if it was to happen) is suppose to go perpendicularly to CRL under Aotea station (not sure where from there though). Transfer between heavy and light rail can be very easy if both systems are frequent enough. Erentz, you are double counting. If it’s 48tph total, thats 12tph west and 12tph south at Mt Eden junction, and 12tph east and 12tph via parnell at Quay Park Junction (approximately). The crown appears to hold two thirds of the shares in CRLL. https://app.companiesoffice.govt.nz/companies/app/ui/pages/companies/6267870/shareholdings? I heard the fuel tax will be 10c per litre rising to 25c per litre if you have a Chinese sounding name. Don’t forget to factor in the effect of a falling exchange rate. Winston wants it at 60c US. The NZ dollar was at 39c to the US dollar in 2002 and the sky didn’t fall. The dollar is basically neutral, some costs go up some go down. Oh no, it seems like an incredible mistake not to build the Beresford Square entrance for the K Rd station. Is Twyford well aware of this? 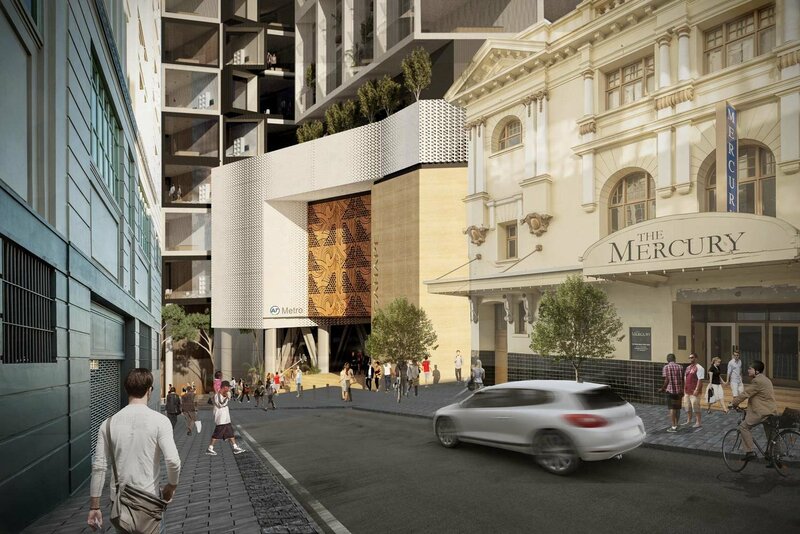 Unfortunately the decision to only build the Mercury entrance seems like an incredibly ‘Auckland’ thing to do. Why can’t our new transport modes be built to world class standards? No Scandinavian project leader would say “That’s not a difficult walk, it’s good for you.” To limit the use of the station to able-bodied, young people is terribly lacking in foresight and is irresponsible use of funds, quite frankly. If we are to overcome our hilly terrain we need to build for it. One station on Mercury Lane isn’t good enough. 100% agree – I don’t even know why we need an entrance way down Mercury Lane, other than for emergency purposes. There’s pretty much nobody down there! Besides the ‘too much effort’ line they were spinning to Simon Wilson. Somone probably owns some dirt on mercury Lane side of K Road and has pushed council to get much needed foot traffic to that side of K road. Beresford square is a much nicer place for an exit and would be the obvious choice for a station though. The Mercury exit would become more like an emergency/secondary exit. Which is why if I owned land there I would lobby to get Beresford off the table. Also they were saying Beresford would cost more due to having to look after the heritage buildings. There is a lot more development potential around Mercury lane and this area will transform post CRL. But Beresford gives access to a lot more people and should open as the main entrance. I have heard from one member of the CRL team that the issues mentioned above including length of platforms and the second entrance are being re thought and investigated. So Kevin, the fat (or should I say, physically challenged?) new generation will cope at K Road? Don’t you mean their under-caring parents. Is there still time to add the Newton station back to the CRL? Given the large amount of potential redevelopment of Newton, the CRL should be a catalyst to add many more apartments so close to the city. I like the idea of moving the Mt Eden station closer to Dom road so that it serves as a proper interchange with LR. Having the interchange outside of the CBD makes a lot of sense. Can Newton Station be included without losing the grade separated junction? I think that was one of the main reasons it was cut. isn’t K’Rd already a proper interchange with LR and only one stop away? Yes Newton cut due to getting grade separated junction or resilience etc & of course cost saving being the deepest station of the original 3 new ones. Other reasons think due historic building issues/risk….off the top of my head, may be others. There was also less development opportunity due to the viewshafts limiting building height around Newton. Mt Eden station being in a dip allows tall buildings in the surrounds. Is there a map like this for the light rail (CFN2) routes? It is a smart move to give Twyford both housing and transport. It means AT won’t be able to shaft his housing plans the way they undermined the Special Housing areas the last lot gave us. If they try to condition a project away then he can cut their funding. Phil & this government must fasttrack completion of a future-proofed CRL now. New Zealand is hampered in so many ways by Auckland’s inability to move both domestic or international visitors around the centre gateway of our biggest city. *Capacity on trains and for stations is under projected for future passenger growth. *K-Rd station is a crucial hub for city access and as such needs multiple entrances and to be created with space for future capabilities when station is so deep underground. The project is already underway… the money is being spent now… so let’s just get it right this time! I do like the combining the transport and urban planning under the same minister. I think we have all realised these matters are intertwined and best seen together. He has indicated a few things which I think are very positive such as LR to Mt. Roskil within 4 years and LR to Westgate within 10 as well as building communities around transport nodes. The question for me is financing. I have heard a lot of number been thrown around for all sorts of projects and I am unsure how this will be paid for. But let’s see. It should be fine because of the ATAP process. I didn’t just mean for transport but the entire Gov budget. Does anyone know what is happening with the western light rail line? I am curious how it would connect at the city end, given the planned Queen Street light rail stop at K Road. Who knows exactly how they’ll manage “the merge”. But in the old Tram days, trams used to make turns into and from Queen St on to K’Rd going East and West along K’Rd, so the original trams managed the grade and modern LR would too. The issue is these LRVs will be a lot longer and there was the plan to “dive under” K’Rd for the Queen St LR. Conceivably, they may route the Western light rail separately from the Queen St one to get from Gt North Road to downtown. In some ways that could be good because you’d have two (actually 3 once CRL opens) ways to get to/from various part of K’Rd with that. Yes, trams used to terminate there [or at least hang about there a lot] in the “old days” if I remember correctly. Before the motorway cut the arse out of the area. Someone told me a couple of years ago there was a bar near there called the Station or similar there which was apparently named after that previous usage in the area. Makes sense to do that, so Western folks can transfer and use the (yet to be agreed to) Beresford St entrance of the CRL to go downtown, east or south, or walk 300-500 metres to the K’Rd station at Queen St to head for the Airport or points that way. So I think this is the original “station” [terminus technically] context the name refers to. Better name than “The Beresford Street Pisser” I think, don’t you? Interesting thing is that used to be called the Supper Club bar. It changed to The Station Cafe after the CRL had been announced, so I wonder if they are actually talking about the future station more than anything. But I agree, sounds better than the ‘The K Road pisspot’! Transferring a full tram onto potentially already crowded CRL trains at K Rd doesn’t make a lot of sense. The first decision to be made will be whether to follow Great North Rd or run alongside the NW Motorway to Newton Rd. Been pondering this the last few days etc, also note new post in a few days will come out with details on this. Perhaps the alignment shouldn’t be to merge with a difficult K’Rd Queen St alignment anyway but run down Albert St like most Northwest buses would of gone down in the future anyway. If we were to have the Beresford Sq entrance for the CRL then we can interchange there from NW LRT as you would run LRT along K’Rd then down Pitt St, Vincent, Mayoral then Albert. I think we are all still thinking small like the National Party is still in power & have to fight of scraps of transport spending. I’m seriously thinking that Queen St/Dominion Rd LRT could really maxed out and be a victim of it’s own success. K’rd will also have major cycling along it. How about that the earlier AT plan of running LRT on Sandringham Rd as well as Mt Eden & Manukau Rd’s being needed in the future. This means you would have S & D rd’s merging onto Queen. Mt Eden & Manukau merging to Symonds St.
Don’t think we would want NW LRT merging to Queen as well especially if these get very busy. If we upped frequency & length it could handle it but do we really want 99M walls of LRT vehicles every 5 mins both directions going up & down Queen St? I think that surface running light rail in the CBD just isn’t going to be practical in the long term. With high frequencies there will be many pedestrian casualties and problems maintaining signal priority on Wellesley Street and Customs Street. I think that in the long term a tunnel will be required, although it should be much cheaper than the CRL due to the less strict gradient requirements of light rail. Alternatively push the pedestrians up a level like they do in Asia. Anyway, best focus on a step by step process. I’d refer you to Melbourne, where surface running light rail/trams are more abundant in the CBD than what I expect we’ll see and they seem to cope, so do those from out of town as well, with little or no direct advice as to how it works. But – the street-trams in Melbourne are S L O W. They are not ‘rapid transit’. Auckland seems to be under the impression that it can run rapid transit through CBD streets. Well newsflash: It won’t be rapid. I can assure you the part approaching the CBD of the current rail network is not particularly rapid either. We could get into semantics, but a short CBD section of a rapid network that has slower speeds but maybe saves a few billion in tunnels is probably a good solution. It works pretty well in San Diego. How about running the NW LRT down Grafton Gully instead? That way it could serve the universities as well, and be a short transfer by bus to the hospital. Run it down Shortland St, to bring that part of the city in to the mix as well (if LRT can handle that gradient). Bit of long way around to not achieve much? May as well go directly to the city core as directly as possible within reason. Excellent post. One of the most important, time critical, and sensible posts I’ve seen. CRL definitely needs to be built for 9-car that is the most critical to save future expense. Beresford sq entrance is next. Well, someone has actually made good planning an example. Especially when it comes to trains, which can be lengthened…. to give more capacity. Well done. I was thinking when reflecting on yesterdays Fixing the National Land Transport Fund post that the BCR/modelling process that supports how benefits are attributed to projects also needs revision as it seems that the Benefits are overstated and Costs understated for roading projects and the reverse for PT projects. I think this is based on the underlying assumptions used to are an extension of the status quo and group think that boils down to the view that everyone wants to drive and no one wants to use PT. This might of held true when PT was pretty much buses, but with a higher frequency rapid transit network emerging this is more like a story of emperors new clothes. I look forward to an announcement of revisions to the NZTA EEM that reflect more of the reality of how things are unfolding now. I’m guessing that you’re familiar with the models in your professional capacity, do you have any ideas or suggestions for improvement? There are people who comment here who could write a post about how models could be improved. I wish they would! I don’t work in the area, just have the confidence from other engineering modelling to read the traffic modelling reports and international papers on the subject and realise that NZ’s modelling isn’t just erroneous, it follows an international pattern of roads-biased politicking. Re: K Road, the capacity is (comparatively) irrelevant. Accessibility shouldn’t be hamstrung due to demand. Having only one entry is just dumb. Every station has multiple access points regardless of size.. If it’s hard to get to, people just won’t use it. I can see why they only wanted one station, but had to think why Mercury Lane instead of Beresford Square anyway? I can only guess that it’s mainly due to not having Newton Station anymore the catchment lost is somewhat made up for with the Mercury Lane one been close to that area. The plan is to build up the Mercury Plaza area so that there will be a lot more residents there in the future than currently. It was chosen for its development prospects. Also as someone has already said Beresford Square area also features some heritage buildings which make it a little harder to build. Having said that, right from when it was announced, I have disagreed entirely with only opening one entrance. Pretty much almost all underground and stations around the world have more than one entrance to start with. Secondly, even with future development in the Mercury Plaza area, I think the majority of residential catchment and retail activity will remain up on and near the K Rd ridgeline, which the Beresford entrance is much closer to. It would be interesting to see if the Beresford Sq entrance issue is on the radar of the Central City Residents group who are having their AGM on 6th Nov at 6pm at the Ellen Melville Centre on Freyberg Sq. It was the rapidly rising construction costs which meant the Beresford entrance was dropped. See how even Fletchers has been bitten hard by the unprecedented rise in all construction costs and they could expect a substantial margin above the hard cost as well when pricing a new project. That guy Meale is a real worry. Sure comes across like that. His terrible answers in the interview sounded more to me like someone who was taken in by an amicable drawing-out interview technique, perhaps saying a few things that just popped into his head. It did not sound like someone who’s been trained to beware the sound bite. Any ideas, Alphatron, about how to make sure he doesn’t dig his heels in but instead incorporates the reactions to his words into his wider understanding? Can you shed any light on how Mr Meale may have come to believe that access for the full range of pedestrians to a public facility is classed as ‘desirable’ rather than ‘achievable’? I’m wondering how we give him a chance to save face instead of reacting defensively. Lobby the key members he ultimately reports to (Minister, Mayor?) for a quiet meeting with him where firm expectations are set that he will honour the priorities of this century not the last, and only go public if they are not. And the same with the layer/s in between. I would suggest the new government should approach HLC and tender private developers to build a group of high-rise mixed-used tower on top of the new stations land. The government then buy all the affordable units off the plan and sell it to first home buyers though rent-to-own scheme to give developers more certainly and less risk, which in turns makes development financing easier and the project go ahead faster. The commercial part of the building and the luxury units can be sold for profit, which the profit is value- captured that recycle back to the infrastructure fund and repeat. What is the ‘further investment’ needed to lift CRL capacity from 18 to 24 per hour per track? Why wouldn’t you design it for 24 per hour from the outset? Sydney’s City Circle ran 24 per hour with bog standard 1920s vintage four aspect fixed block signalling. A flat junction where 24 per hour splits into 12 per hour on two branches has 24 trains per hour (12 in, 12 out) occupying the conflict point. It’s not ideal from the point of view of resilience, but it’s perfectly possible. I believe it is mainly around the Newmarket, Quay Park and Wesfield junctions being the limiting factor. I imagine the idea is that these will be dealt with over time as demand necessitates more services. Lifts, escalators, easy access entries etc are especially important is one is carrying luggage from the Airport. Bite the bullet and make it great to start, with suitable allowances for future phase 2 etc expansion. I wonder if we could increase the capacity of the City Rail Link further than just using High Capacity trains by installing the Communications Based Train Control systems (CBTC) using Moving Block signalling in order to decrease the headways to about the distance of typical Metro trains thus increasing to about 60-72 trains per hour. Why didn’t they thought about it?